Our Standard Drip Plate, furnished with a smooth, factory-formed hemmed edge for installation safety and uniform appearance. 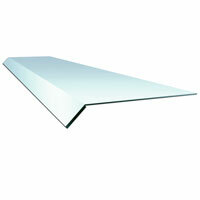 Standard DP Drip Plates are compatible with all H&B flashing products. Same as above, for lip brick conditions. 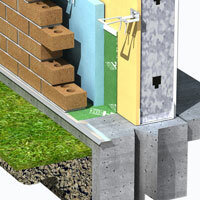 Optional Foam-Tite Seal™ offers unique added protection against the ingress of water in cavity wall construction. It is a continuous 1/8” strip of factory-installed compressible foam to act as a bond-break and help prevent air and moisture infiltration. Adds our optional Flash-Adhere™ Adhesive Strip (see note) to the FTS Drip Plate (as described above). This adhesive strip (with tear-off release paper) is factory-installed on the top side of the drip plate to aid in the precise and permanent placement of the flashing. Drip Plate Inside and Outside Corners are pre-formed pieces with a smooth, uninterrupted, hemmed drip edge to maintain the integrity of the flashing system. Available with Foam-Tite Seal™ and /or Flash-Adhere™ Adhesive strip (see note). 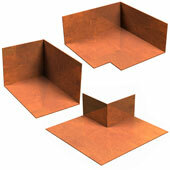 For corner pieces, reference “inside” or “outside” with above product numbers. 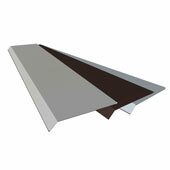 Available 1-1/2” or 3” wide (other widths available on request). Fabricated from Type 304 or Type 316 Stainless Steel. Also available in copper and lead-coated copper. H&B sources Stainless Steel from a wide variety of vendors. Per the International Stainless SteelForum, Stainless Steel objects have an average of 60% recycled content. 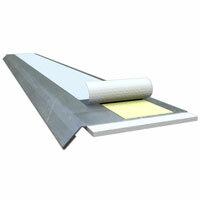 Foam-Tite™ Seal and Flash-Adhere™ Adhesive Strip are compatible with ALL types of flashing. 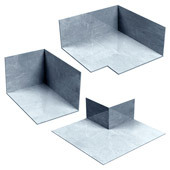 H&B does NOT recommend the use of galvanized sheet as a drip plate/edge. *When cleaning the exterior veneer, the cleaner’s manufacturer recommendations for protecting metal must be followed.